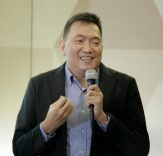 In my earlier post, I noted that the BIR has been releasing issuances showing that they are keen on collecting more revenues from real property transactions by updating real property values. I also noted from the BIR’s Memorandum of Agreement with CREBA Land that the BIR’s target date for the updating of real property values is June 30, 2010. The BIR’s latest issuance, Revenue Memorandum Order (RMO) No. 41-2010 dated April 23, 2010 confirms this deadline date. Basically, there will be three committees who will be working on the updating real property values, namely: the Executive Committee on Real Property Valuation (ECRPV), the Technical Committee on Real Property Valuation (TCRPV), and the Sub-Technical Committee on Real Property Valuation (STCRPV). The nitty-gritty work will be done by the STCRPV, which shall be composed of the following: the Revenue District Officer (RDO) as Chairman, the Assistant Revenue District Officer (ARDO) as Vice-Chairman, and the (1) Municipal/ Assistant City Assessor, (2) Local Development Officer (Office of the Mayor), and (3) Two (2) licensed and competent appraisers from a reputable association/organization of appraisers as members. To learn more about the procedure for determining the updated zonal values, click here to get a copy of RMO No. 41-2010. Annex A is the format of the invitation letter that the BIR will send to members of the committees(click here to download a copy of Annex A). Annex B contains the Classification Codes which can be seen below (click here to download a copy of Annex B). Annex C is the format of the Schedule of Recommended Zonal Values(click here to download a copy of Annex C). RESIDENTIAL LAND/CONDOMINIUM PRINCIPALLY DEVOTED TO HABITATION. LAND/BUILDING DEVOTED PRINCIPALLY TO COMMMERCIAL PURPOSES AND GENERALLY FOR THE OBJECT OF PROFIT. INDUSTRIAL DEVOTED PRINCIPALLY TO INDUSTRY AS CAPITAL. AGRICULTURAL DEVOTED PRINCIPALLY TO RAISING OF CROP SUCH AS RICE, CORN, SUGARCANE, TOBACCO, ETC. OR TO PASTURING, INLAND FISHING, SALT-MAKING, AND OTHER AGRICULTURAL USES INCLUDING TIMBERLAND AND FOREST LAND. GENERAL PURPOSE RAWLAND, UNDEVELOPED AND UNDERDEVELOPED AREA WHICH HAS POTENTIAL FOR DEVELOPMENT INTO RESIDENTIAL, COMMERCIAL, INDUSTRIAL, INSTITUTIONAL, ETC. MUST NOT BE LESS THAN 5,000 SQUARE METERS. VICINITY MEANS AN AREA, LOCALITY, NEIGHBORHOOD OR DISTRICT ABOUT, NEAR, ADJACENT PROXIMATE OR CONTIGUOUS TO A STREET BEING LOCATED. b. The final recommended value which is the average of the two (2) highest recommended values. The guidelines look fair and the procedure is quite clear-cut. I really think that the schedule is too tight though. It’s really the BIR and the municipal/city assessors who will be working hard on this as my understanding is that the private appraisers can decline the BIR’s invitation for them to join the STCRPV. On another note, it’s good that there will be public hearings, the schedules of which should be disseminated in newspapers and notices to the public. So what does this mean to us not just as investors but also as property owners, why should we be concerned? We should be concerned because if the revised zonal values exceed the market values of our properties, this would mean a corresponding increase in the applicable real estate taxes that we pay. As mentioned in my article: How I estimate the market values of foreclosed properties, market value is defined as “the estimated amount for which a property should exchange on the date of valuation between a willing buyer and a willing seller in an arm’s-length transaction after proper marketing wherein the parties had each acted knowledgeably, prudently, and without compulsion.” In other words, a buyer and a seller who have no compelling reason or special circumstances to buy and sell, respectively, agree on this price. Market value is not the same as the technical term “fair market value” (FMV) which is used for taxation purposes, and is based on the zonal value of a property. 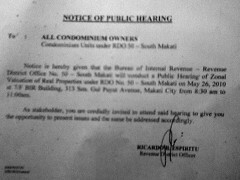 In the condo where we are renting right now for example, we saw a “Notice of public hearing” (please see picture on the left, sorry some portions might be unreadable as my camera phone stinks… hehe) and the hearing will be conducted by the BIR. 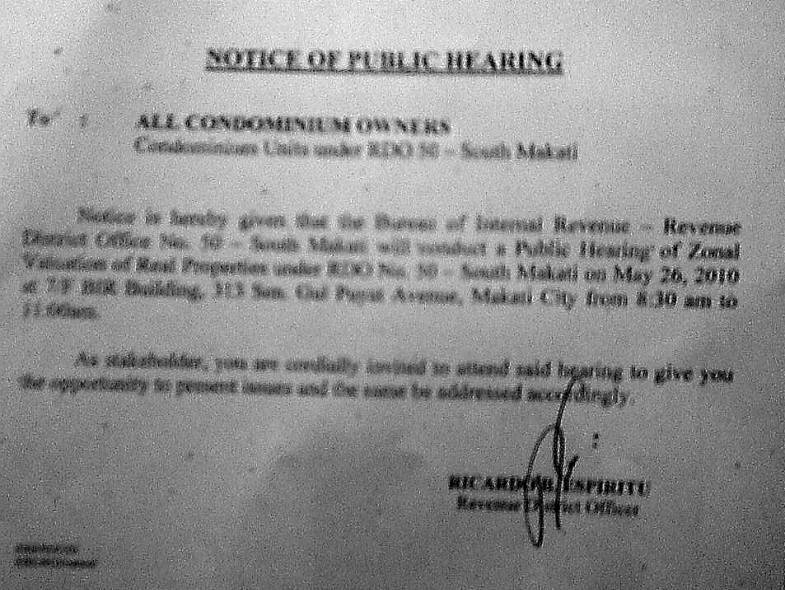 Unit owners of this particular condo in Makati were invited to attend the said hearing to be able to have the opportunity to present issues and the same be addressed accordingly. I believe helping ensure that the zonal values/fair market values be really “fair” is one such issue. Let us all help and do our part given the same opportunity. We would really appreciate your thoughts on this. Thanks!